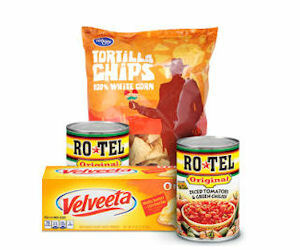 Kroger and affiliate store shoppers can score free Rotel Diced Tomatoes, Velveeta Loaf, and Kroger Tortilla Chips with ClickList! Sign into your account to download this exclusive digital coupon. Add two (2) cans RO*TEL Diced Tomatoes (10 oz. each), one (1) Velveeta Loaf (2 lbs.) and one (1) bag Kroger or Fred Meyer Tortilla Chips (9.75-10 oz.) to your ClickList cart. Offer expires March 20, 2017. Must buy all items in a single ClickList transaction.